It’s been said that the best survival knife is the one you have with you. And that’s partially true because as it’s also said, only the bad workman blames his tools. But there’s always a limit to everything. There are certain features that make some knives better than others. And generally speaking, besides the obvious differences, in order to get exactly what you were looking for you need to aim for the details. Besides the personal preference which by the way is one of the most important aspects when choosing an outdoor or survival knife there are general guidelines for choosing a good knife and it seems that reputable brands and world-famous knives conform to these standards. At a survival or outdoors knife, the blade thickness is extremely important. To keep it simple you can search with the following in mind. If it ain’t thick it ain’t good. We suggest a thickness from at least 0.15 to preferably 0.25 inches or even more. This is not a specific outdoors/survival/camping knife’s requirement. Basically, on every knife you will ever want to buy, the handle needs to offer the best comfort when making high force cuts. If when making a hard cut the handle or blade has painful spots don’t make the buy. It is not so important in a survival knife for the handle to pass the beauty test, however, we recommend to get one you like because we consider that you will use an attractive knife with more determination. Although this is just a subjective psychological fact. You will be better off if the looks don’t matter to you so you can make the most objective choice possible. For this specific domain, a fixed blade knife at four to six inches is in most cases the best choice you can make. Of course, there will always be folding knives that will do the job just fine and fit your pockets, but because the handle is two separate pieces joined by a hinge, there will always be chances of breakage. Also, folding knives tend to have shorter and thinner blades. If for you portability is a no.1 concern try finding one with a thick blade and a well-known and tested hinge mechanism. The blade of the knife should in most cases be a full tang one. A full tang design implies that the blade continues all the way to the end of the handle, and most important, in one piece. If you ever had a partial tang designed knife you might know that it is not so break-proof. If you want a more scientific explanation, the secret stands in the metal fatigue effect. Using a knife is a very repetitive cycle for example when cutting a tree. You thrust the knife into the wood, then it remains blocked and you need to make those repetitive arm twists to get it out. At first, this may not seem a big deal, but metal fatigue consists exactly in this. When progressive and localized structural damage occurs to weak portions of the knife, the square atomic structures inside the metal get weaker, and over time in the points where the knife is partially tangled, breakage occurs. You can try this yourself with a steel bar. At first, try breaking it with only a move. Impossible right? Now fix it in the ground and keep swinging on it. See? It seems like you gained super powers. The bar became hotter and eventually broke in a weak point. Pretty cool right? Now get back and look for a full tang knife. Buck Knives Inc. is an American Knife manufacturer founded in San Diego, primary manufacturing sport and field knives in the past. The knives they manufactured were so well made and people loved them so much that the term „buck knife” became used even for similar knives from different manufacturers. The Buck Frontiersman is a heavy-duty knife that can be used in multiple environments. We think it suits the outdoor/survival branch pretty well but it may also be very good at hunting and even fighting. It has a very strong blade with full tang construction, so it meets the endurance requirement. It has a blade of 6.25 inches in a straight back bowie style with a 420HC and Satin Finish. The handle is a black micarta and has an aluminum pommel and it includes a black genuine leather sheath to carry around. At a weight of 13.3 ounces and an overall length of 11.75 inches, the knife proves it is not for tender hands or gentle touches. It must be handled by a man who knows his knives. At the price, the Buck Frontiersman is a bargain. And as the icing on the cake, it comes with Buck’s Forever Warranty although we don’t think you will ever have something to send it back. Clearly with all of these the decision on buying it is a no-brainer. Handling a completely handmade knife is an awesome feeling, especially knowing that a skilled craftsman manufactured it by putting his soul into it. The Fallkniven Green Canvas is exactly that. A masterpiece fully hand-made by a true professional. It comes with a stainless blade at a length of almost 4 inches and a plain edge, a leather sheath, a green Canvas Micarta handle material, an overall length of 8.3 inches, and a weight of 7.05 ounces, so certainly not for slender hands. The blade is as you would expect from such a quality knife a full tang type that continues the handle at full breadth which of course gives the knife extra solid weight in the hand and more life years. For those that want a more exclusive knife, this is an excellent choice. It comes with a very comfortable to carry all black sheath, a cross guard which is made of nickel silver. A truly great knife for outdoor activities and survival, suitable for almost any cutting activity where only the best is required, the Fallkniven is the definite choice for people who do not want any compromise regarding quality. We said it before and we say it again. Cheap doesn’t in all cases mean bad. There are a lot of knives that offer great features and quality for a decent price. And the Columbia River Onion Skinner is one of them. As a small history of this knife, the Hawaiian knifemaker Ken Onion which is the designer of this knife worked for more than five years, and to understand what he did in this time here is some info in a nutshell. He launched an extensive field testing program to get his skinner knives to be tested by real professional hunters, taxidermists, and even Alaskan guides in order to get their feedback. It is said that the knife was tested on over 60 Alaskan bears, and different animals like deer, antelopes, sheep, cattle and even hogs. With the feedback, he constantly improved his knife to incorporate everything the professionals demanded. And after all, this hard work it was almost impossible to result in a mediocre knife. And of course, it didn’t. The knife has become now one of the favorite knives among many outdoor loving persons, taxidermists, hunters and top guides. • Thin tip with slightly convex grind near the tip that minimizes drag. Actually, the single downgrade if it can be considered one is the stiff leather sheath that somehow makes it hard to insert the knife with only one hand. However after a period of usage, it seems to become more flexible. There you go. A five-year tested knife that is ready for the long and steep road. If it looks like the one you need, the Onion Skinner is a great pick of which you won’t be disappointed. The Gerber Bear Grylls Survival Series Knife with serrated edge is one of the Gerber’s Best sellers in the survival/outdoor knife branch. It comes in two different versions, a serrated blade one and a plain version. It is up to you if you need the serrations but if you want an added cutting power and don’t want to fuss with sharpening your blade too often we recommend the serrated version. The sheath that you get when buying this knife has a lot of surprising perks and features that you don’t see very often like a Velcro closing system, a diamond sharpening stone built-in the back of the sheath that comes in very handy when the knife becomes chippy, and a surprisingly good survival fact book with tips and tricks from Bear Grylls which you’ll see that will help a lot even when you are an inexperienced individual when it comes to surviving in harsh environments. Believe it or not, the sheath also features a fire starter ferrocerium rod lock that works with the striker notch incorporated into back of the knife. • A stainless steel pommel at the base of the handle for hammering different objects. So who is this knife for? 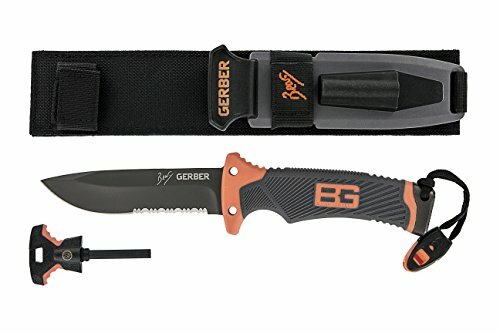 The Gerber is great for outdoor activities, hiking, camping, backpacking and probably even hunting, however if you want a true tactical or military knife you should look at our tactical/military knife reviews because this one is not a truly professional one, but a great knife for amateurs that don’t want to spend a lot of money for a knife that will help them a lot throughout their adventure. As you might already know, the Columbia River Knife and Tools company or C.R.K.T is famous for their great combination of low price and quality on most of their knives. They literally make awesome build and quality knives some tested for years to achieve perfection and offer them for good prices. The C.R.K.T. 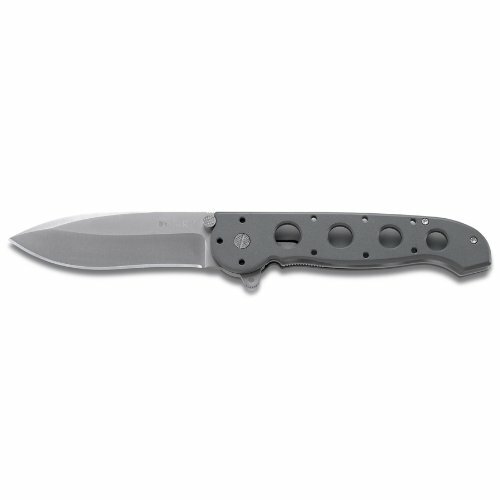 Charcoal Gray Folding knife is no exception. It comes with great specs that other companies hardly offer at more expensive knives, like an AUS 8 stainless steel blade in a non-reflective finish with a razor-sharp edge and a spear point for easy material penetration, a grey anodized aluminium handle, fibrous washers at the blade pivot that assure smooth one-hand opening and closing, using Carson’s dual checkered thumb studs that act as a blade stop. Columbia River also incorporated the LAWKS system that converts it in a fixed blade knife. Still this doesn’t mean that it will fully act as a fixed blade one, and definitely, the mechanism is not break-proof. The blade is just under 4 inches and may be considered „huge” to people who are not used to carry a knife but overall I would just name it large enough for various uses. For the price, you can’t go wrong with this knife. If you don’t want a fixed blade knife this might be one of the best picks as your next outdoors knife. The Gerber Air Ranger is a great knife when considering the ease of carry, price, great ergonomics and ease of use. It was designed by Bill Harsey which is an award-winning American knifemaker best known for his collaborations with various companies, in this case, Gerber. The shaving test is a trend that became more powerful over time. It basically says if you can shave with your knife, the blade is razor-sharp and can make perfect cuts. In this case, the Gerber Air Ranger passed the test with the non-serrated part of the blade. If I could change one thing about the design of the Air Ranger it would be to round off the square edges to make it more pocket-friendly, but all in all, it still has a great feel. Overall a great knife at a great price. If you want a knife that will always be there with you when cutting a rope to tie your tent, or maybe when splitting tree branches for the camp fire, the Gerber Air Ranger is a great pick. Fallkniven is truly one of the best manufacturers of knives in the world. Their main concern is quality. You won’t really ever get a Fallkniven knife that has major flaws. They have some of the best craftsmen in the Scandinavian peninsula, to produce the best knives in the world. With the Fallkniven A1 Survival Knife Fixed Blade, you can go anywhere and not think about whether the knife will do the job because it will surely do. It was tested multiple times especially in brutal work environments and throw tests and it completely passed all of them without a scratch. Oh and even the shave test has been fully passed by the Fallkniven A1 Survival. 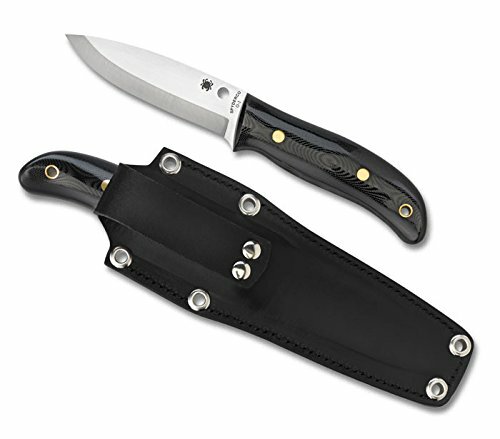 It features a Kraton(a semi-rubbery high density polymer) handle with great ergonomics which due to its form factor can be used at full pace even with wet hands or gloves, a Zytel sheath, an incredibly 0.25 inches full tang sharp blade right out of the box that doesn’t need any special maintenance for a long time. Don’t get me wrong, you will be going to need an extra sharpening now and then but the blade is made out of extremely durable materials that make the sharpening process a seldom habit. Speaking of dimensions, it has a blade length of 6.3 inches and an overall length of 11 inches. This knife is legendary among European military circles and it really needs to be experienced to be fully appreciated. Don’t let the sleek and simple looks fool you because handling it will make you better understand what a true performer is. In the price range, we consider it is the one of the best picks. The Buck Hoodlum is made for ultimate survival. Good for chopping, good for cutting, good handle and good feel. It has many features that add up to the overall great experience when holding the knife and have a new challenge to test it on. Firstly this is not a tactical knife. 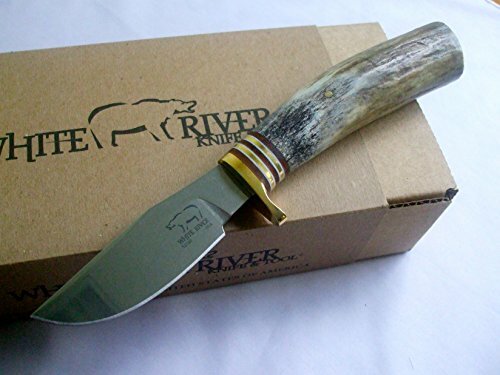 If you are looking for hunting knives you can find them on our hunting knives reviews. The reason we say it is not tactical is because as some may say it „rattles” a little bit in the sheath so you won’t be very stealthy, but in the end, you don’t even need to be on an outdoor/survival situation, because the knife will always encounter dust and water gathering up in the sheath so a little play between the knife and sheath helps to displace those elements. So for what it was made for it does the job perfectly. Overall great knife, at a great price that we think you will love. When it comes to these type of knives don’t think twice. You will ask yourself later why you didn’t buy the Buck Hood Hoodlum earlier. 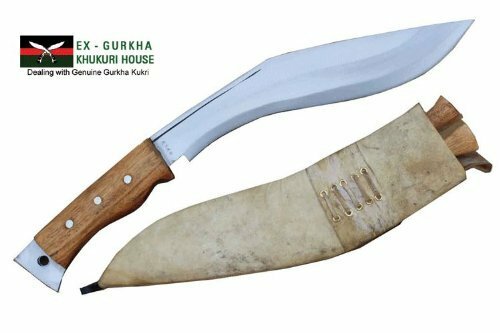 The Kukri blade was a long time favorite of the Gurkha Warriors of Nepal which were the brutal mercenaries who used the blade for over 150 years in the service of the British Empire. However, this doesn’t mean the blade has to be used in combat or used as a weapon. Over time, it was improved to resist in more demanding survival or outdoor environments because it has been a while since the Gurkha Kukri were using them to kill the enemies. Unlike other knives that use low-carbon steel to protect a high carbon middle and razor-sharp edge, the Gurkha Kukri’s blade is made of SK-5 high carbon steel making it one of the heaviest Kukri blades on the market with a remarkable cutting power. The blade has 12 inches and a thickness of 0.3125 inches, an overall length of 17 inches and a weight of 22 ounces. So this is definitely a big knife if it can be considered a knife because it resembles more with a machete. 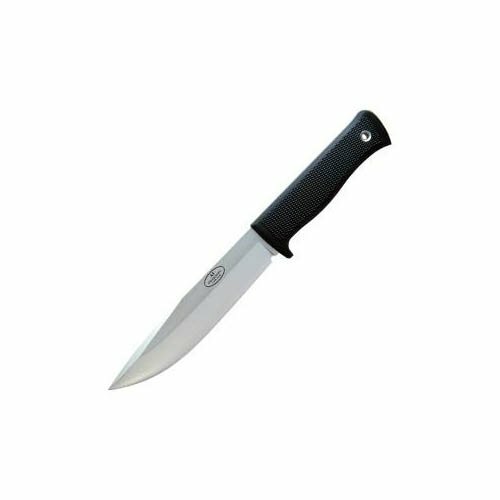 The handle features a rich textured Kraton handle that is either a soft plastic or a hard rubber whatever you may like to call it but overall it provides good grip and comfort when using the knife. Also, an interesting fact about the design of the handle is that the Gurkha people who invented the knife were tiny people so they made the blade an inch wider at the tip, which shifts the knife’s balance point forward to allow people with small hands strike substantial hits without a big effort. The Gurkha Kukri comes with a sheath made of two pieces of molded Kydex plastic vertically suspended on a polyester top. It can be attached to the leg, on the belt loop or on a padded backpack belt. In all cases, it provides an easy to carry experience. It is as clear as it may be. The blade on the Gurkha Kukri has no match. It can literally smash anything in your way without gaining a scratch no matter if it’s wood, rope or even flesh and for the price, it is definitely a good pick. The story says that the idea for this knife was born from a conversation between Tom Brown and a journalist that asked him if he will ever find himself deep in the woods in a survival situation what would be the perfect knife or tool to have with him. He answered the question by saying that the knife he was thinking about didn’t exist because he didn’t invent it yet. So he decided to make his idea a tangible product, and after seven years of designing and continuous perfecting his prototype, he came up with the Tom Brown Tracker T-3 that many love today. The Tom Brown Tracker T-3 is a combination of a multi-tool knife and a hatchet. It combines the best of the both worlds.It has a huge blade capable of chopping, carving or maybe making spikes for a trap, or any other actions that require great power. On the top of the blade, you get a saw back which is perfect for notching wood for using it as a tent peg or whatever you may need it for. We definitely recommend this knife when it comes to outdoor/survival situations, you can cut wood for preparing the fire, you can make a notch for the tent, you can basically make anything in order to survive even in the worst environments. Ontario Knife Company produces one of the most comprehensive products on the market. Ontario is also a major supplier to the U.S. Government and the U.S. military that used their products for long periods of time and constantly gave feedback in order to improve the knives in the upcoming updates. The Ontario Rtak 2 has one of the most impressive blades. It makes it basically easy to slash and strike everything without feeling that a big amount of force was used and get huge results. You may have heard things about knives that have a blade that is indestructible and can support high amounts of abuse without scratching. Well in the case of Ontario Rtak 2 that is not a legend it is a fact. The blade is made of 5160 carbon steel that is easy to sharpen and blunts very hard over time. Given its thickness, it can smash through wood like through butter. The handle is a canvas-textured Micarta that feels great in the hand providing good grip and comfort even after long periods of usage. The sheath is not the best you’ll see but it will do the job. It is made of ballistic nylon with a clear plastic blade protector. Speaking of dimensions it has an overall length of 17 inches with a handle of 6.5 inches and a blade of 10.5 inches, all at a weight of 1 lb and 6.5 ounces. So the obvious question is who needs a knife that big? Well, everyone who wants a knife that does the job of an axe when there is no axe near, and also a knife that due to the sharp blade can make fine cuts whenever needed. That said if you want a large knife to easily process firewood smash branches, and help you in outdoor activities the Ontario RTAK 2 might be the perfect pick. At Randall, they are craftsman that do their blades mainly by hand. Randall knives was founded by Walter Randall in the US. Randall began making knives as a hobby in 1937 and he passed all his knowledge to his son and grandson that continued the family trade along with other 20 craftsmen. Now the factory and showroom are located in Orlando Florida. The Phantom Reflex is a spring assisted knife. It features a thumb-stud that deploys the blade very fast and smooth. The blade is very sharp and also passes the shaving test, being made of an ATS-34 steel that is very durable. It also features a flipper on the back of the knife that can be also be pushed to open the blade. The handle is made of black anodized aluminum that offers good grip and comfort even after long periods of usage. A very important thing is that it is legal almost everywhere so you don’t need to bother with reading laws. If you want an extremely light and reliable knife this may be your best choice. Bushcraft is a popular term for wilderness skills. Bushcraft is about thriving in the natural landscape, as the Oxford English Dictionary defines it, „skills in matter pertaining to life in the bush”. 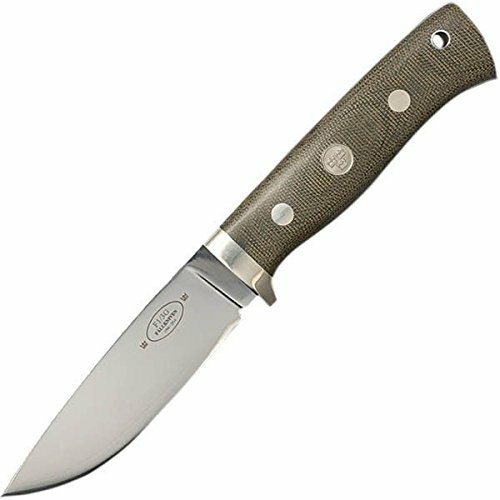 The Spyderco Bushcraft Plain Edge was designed by the tactical bushcraft expert Chris Claycombe and Spyderco designers that worked hard in order to achieve their best with the G-10 Plain Edge Bushcraft Knife. And it seems they did. It has a full tang four-inch high carbon steel blade that holds it razor-sharp over time with 0.14 inches thickness, has no hand guard featuring a Scandinavian sheath. Bushcrafters generally don’t seek the characteristics of stainless over the performance of high-carbon retention and is why Spyderco choose to pick a high carbon steel blade because it holds a long-term edge but also sharpens easily when laying on a new edge. The black handle is made for comfort with a backup lanyard hole and it comes as said before with a black leather sheath that is surprisingly well done with quality materials and gives you more freedom to carry the knife as you wish. With an overall length of 8.75 inches and 7.75 ounces, the Spyderco Bushcraft is a small and easy to carry knife, as you would expect from a knife in this category. Overall this knife is a great performer in the wilderness. It is sleek razor-sharp and can be smoothly used for slicing, chopping and even whittling all done in a traditional Bushcraft style and with the Spyderco’s limited warranty you can be sure that if it happens anything to the knife, Spyderco has your back covered. Les Stroud went to the Norwegian factory where the Helle Temagami knives were made and did some in-depth insights on how the knives are made. The handle of the Helle Temagami is made out of high quality six months old wood that was specially prepared and crafted to provide the best grip and comfort as possible from a wooden handle. Also, it has a full grain leather sheath which is hand-made by a professional craftsman. As speaking of dimensions it has a drop point blade of 3.5 inches, and a 4.41 inches handle all at a total weight of 5 ounces. In Norway as the factory, the director said it is an old tradition to make high carbon steel blades that last longer than for example stainless steel ones regarding sharpness but at the same time are very easy to sharpen, usually, what you would expect from quality Bushcraft knives. The blade features three grooves at the top where you can put your index finger. At first, it was speculated that they were designed to strike a fire but after that, the company offered a press release saying that the three indentations were actually for the index finger to help when skinning an animal. We recommend using this knife in pair with a bigger fixed blade knife so that you cover all your outdoor or survival necessities. If you carry a heavier survival knife with you that one can make the job when having big cuts like chopping down trees or process your firewood and the Helle Tagami can make for the finer cuts like carving, bushcraft or camp chores. In a pair with a bigger knife, the Helle Tagami will make you unstoppable. 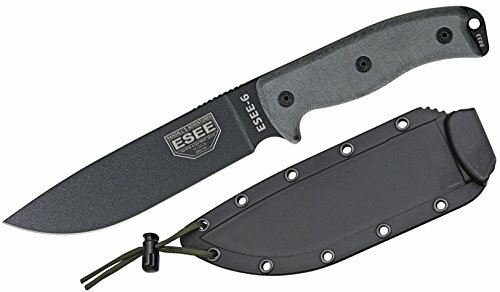 The ESEE-6P is a high performance outdoors knife. It was developed by people with high experience in the knife industry and was practically tested in many environments so that it offers exactly what the customers need. 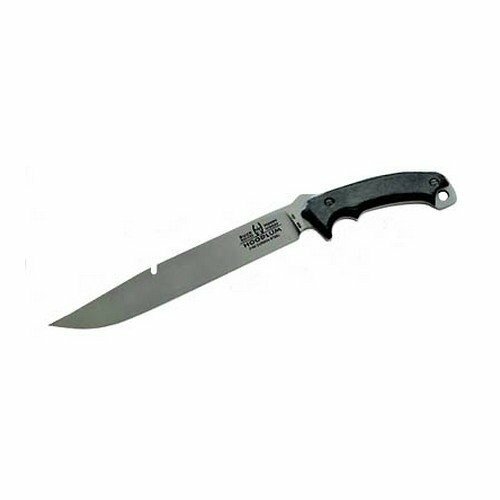 The ESEE series of knives all have a high carbon 1095 steel blade mainly due to the great endurance it offers. Also, the knife has become a very popular choice for an all-around wilderness or survival knife over time which can be seen as a good indicator of quality. There are people who think this knife is too big and other that think it is too small. We think it’s just right for multiple uses. Now it is very subjective on what exact environment is this knife perfect for. We think it is good for hiking due to the very sharp and big blade that lets you cut objects with minimum effort and the Micarta handle with a lanyard hole at the back that lets you secure the knife on your hand, a good thing when hiking and have to climb a steep hill or whatever. Remember that the edge of the blade will eventually rust if you don’t take care of it properly but being a carbon blade it will be easily maintainable. This is a really great knife to have with you at any time, no matter if it’s hiking, camping or just various outdoor activities because in most cases it will save you time and effort just for a symbolic amount of money. We start off by saying that this is a truly impressive knife. The people at White River are some of the best knife makers and you can see their skills just by picking up the knife. This company has access to some very advanced machines and have such an experience in manufacturing knives that other companies only fantasize about. Part of a greater series, the White River clip point has an unmatched quality build that is made for hard use. The handle feels great and premium in the hand because it is made of genuine antler which by the way is an extension of the skull grown by members of the deer family. The carbon blade holds an extremely sharp edge for fine and deep cuts in every situation. Of course, the set is complete with a beautiful handmade leather sheath that is extremely practical. 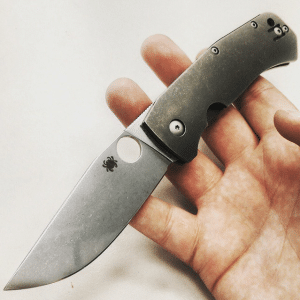 Built to last for generations with the highest quality materials and craftsmanship, the White River Clip Point is really worth pulling out a bigger amount of money to get one of the best knives out there. Now is the moment to treat yourself with a true knife which will make your friends envious and your descendants proud of a knife they may not stumble upon again in their lives. 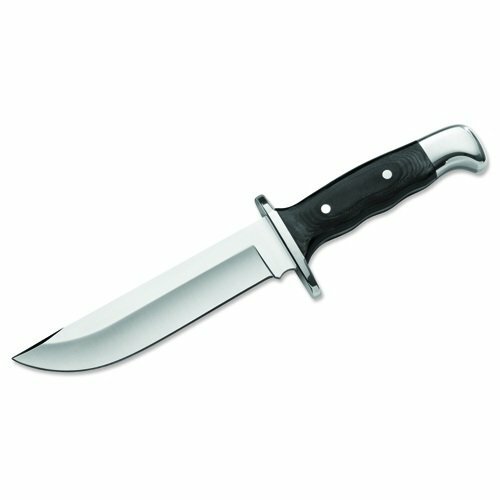 The outdoor and survival knife market has a lot of models from where to choose from cheap to expensive, and this may be a problem if you don’t have much time to waste on this process so we tried to select some of the best outdoor and survival knives that perform the best but also have a reasonable price. That being said, we hope that you found what you were looking for.